With today's update, The Story of Saliria is completed. Thanks for reading! It has been a fun 3+ years of comics for us, and we hope you've liked it too. So what happens next? First off, we're making a book! We're compiling all 167 comics in print form for all your non-website-oriented friends to enjoy! We haven't planned all the details yet (too busy writing comics! ), but we'd like to get it printed by the end of the year. If you haven't already, follow us on Facebook! We'll post all the book updates there, as well as on this blog. Second, we're starting a podcast! This time, we are joining some friends to go on an adventure ourselves - RPG style! That's being run through Rogue Hexagon Studios. It's going to launch next month, and you can follow Rogue Hexagon for updates! And finally, this will not be our last comic. After The Story of Saliria ends, we're going to take a short break to plan out our next comic(s) - we have some ideas going already. And in due time, we will return, and you loyal fans will be the first to hear about it! 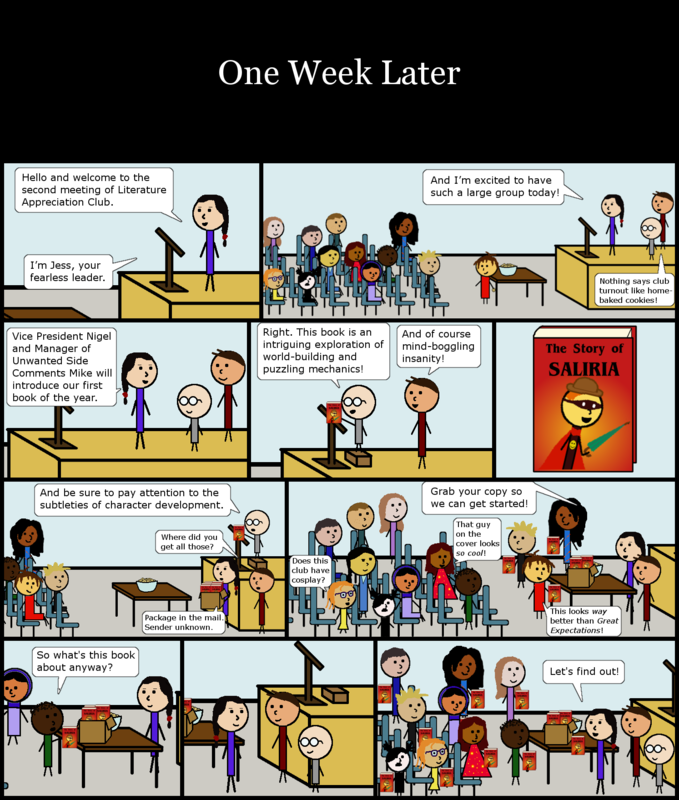 The Story of Salira continues, every week, all summer. What fun! Today marks the 2nd anniversary of The Story of Saliria. And wow, we're coming up on comic #100 soon too! Big milestones all around. Stay tuned for more adventure to come, and as always, thanks for reading! Happy 2016 from Story of Saliria! Thanks to all the old and new friends who followed our adventures and liked our FB page in 2015. Here's to another year of craziness and delightfully horrible puns!